Gaming enthusiast. Aspiring writer. Part-time Ninja. Revolutionary, Fresh, Innovative. All words used to describe Arenanets Guild Wars 2. But here’s another word, boring. The game itself has been out for around a year now, so I won’t bother reviewing it, but after picking it up recently I can’t help but talk about it. 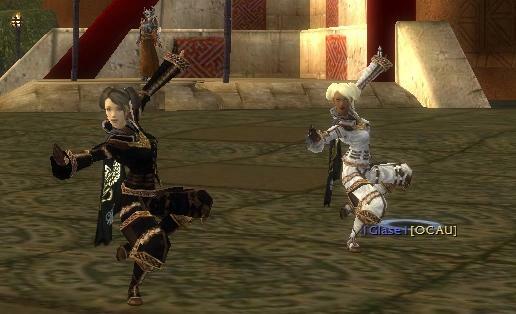 For anyone unaware, the original Guild Wars was released a few years ago, set in the world of Tyria it lured players in with its low level cap and lack of subscription fee. For those that stuck around the game long enough to try PvP would have found one of the most balanced, competitive and enjoyable multi-player experiences I have seen to this day. 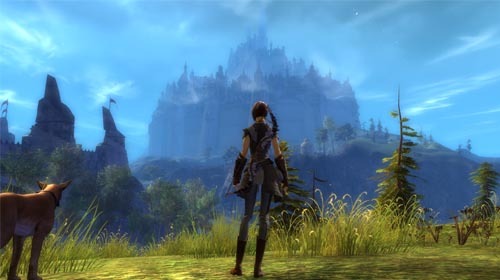 Often I play MMOs in the hope that the competitive play will live up to Guild Wars, and often I am disappointed So you can understand my optimism as I was sitting on the train on the way home a week after building my gaming rig, giddily clutching it’s direct sequel, Guild Wars 2. For fans of the first game, a lot has changed. While the aesthetics are similar (although much, MUCH prettier) and at heart it’s Guild Wars, much of its mechanics have been changed. Combat, one of the first things I get to experience is different than any game I’ve played before. No real word would describe the changes to combat, so I had to made one up, it’s a lot more “actiony”. For a start, it’s no longer a war of attrition, as is the way with most MMORPGs. You won’t be standing toe to toe with enemies, trading blows. Enemies can kill you in a handful of hits, even the mighty Warrior can’t take much of a beating. This is to focus more on two things: a) positioning and b) evading. Positioning is pretty self-explanatory, don’t stand where you’re going to get beat on. But evading adds a whole new element of strategy to a genre that is notorious for stale combat. Activated by double tapping any of the movement keys, your character will jump/roll/dodge in the relevant direction and, if timed right, will invade enemy attacks. A simple change, sure, but the effect it has is monumental. It wasn’t long before I was pelting bad guys with my longbow, rolling forward to avoid a projectile while closing the distance to shortbow range, ducking to the right under a hammer swing, putting myself behind my attacker where my attacks cause him to bleed. Speaking of weapons, GW2 management of weapons is my first major gripe. Unlike the first game, each character has access to more than just one, which is fine, the problems arise from the associated skills. Each weapon has 5 skills linked to it, which are unlocked within the first few minutes of using the weapon for the first time, these 5 skills are permanent for the weapon, meaning you can’t chop and change. The only way in which you can change the first 5 skills on your skill bar, is to change weapons. “Wait, what?” I hear you say, that’s right, you can’t change your first 5 skills, you can’t even put them in the order you like. The only skills you have access to are 3 utility skills and one elite, meaning things get very boring, very quickly. I often find myself changing to weapons that don’t suit my class, like swords on squishys (light armoured characters for the 3 people out there that haven’t played an MMO), just to bring a change of pace in the game, because I’m so bored of mindlessly spamming 1, 2, 3. From a game that seems to have went out of it’s way to make combat more interesting I just cannot get my head around this design choice, I mean what were they thinking? In all fairness the weapons themselves are pretty cool, the animations over-the-top and the combat fast and fun as a result, I just wish there was more depth. Quests. Everyone loves quests, right? GW2 has streamlined the questing process to the point where you don’t even have to converse with NPCs, show up in their general region and quest activates, finish whatever menial task they have for you, get your reward and begone, never having to turn in quests, saving a lot of time in the process. Cool, right? WRONG! After a handful of these you realise it’s essentially a very smart way in which to mask grinding and it almost works, the problem is that the objectives are meaningless, you turn up, kill enough enemies to fill the progress bar until completion and then move onto the next, it gets old very early in the game. With games like Star Wars: The Old Republic going to the effort of giving every NPC a fully fledged back story and motivations, GW2 almost feels like a step backwards. Hoping to remedy this, Arenanet have introduced “meta-events”. Anyone who has played Warhammer Online or Rift will recognise these server wide events, with hundred of people participating at anyone time to bring down a super baddie. These can be fun and are among the more enjoyable things to do in the game, if a little shallow in terms of game-play. And finally I get to the much anticipated PvP aspect of GW2. All my hopes were pinned on this, hoping to live up to it’s predecessor, even just a little bit. But once again, the game disappoints me on every level, at least it’s consistent. Split into two, we have World vs World, massive server battles involving hundred of avatars on-screen at once held on massive maps, the scope is epic and the first few runs are enjoyable but lack any real skill or co-ordination. I found the best strategy to employ (if you can call it strategy) was to select the enemy closest to me, spam skills in the hope of killing him, if unsuccessful (which was 90% of the time) one of two things happened, either the guy ran back into the 100 strong mob behind him thus rendering him untouchable. Or that same 100 strong mob moved forward and wiped me out. 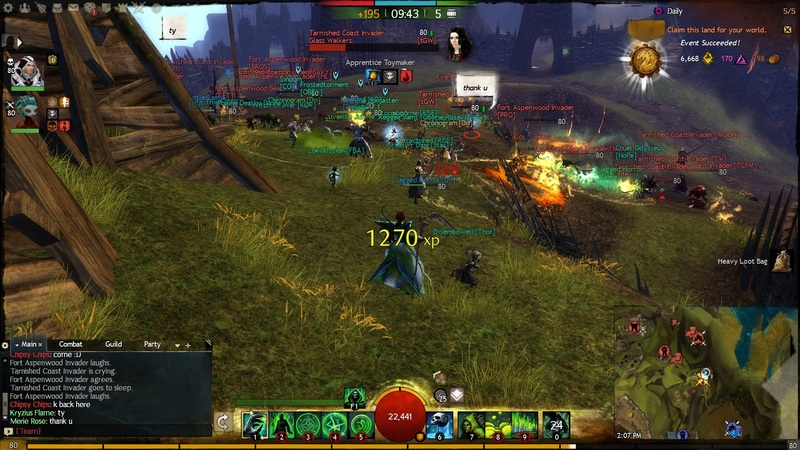 WvW is similar to the previous games Alliance Battles, except with less skill required, which is really saying something. The other type of PvP is of the structured variety, 5v5 or 10v10 games played out on a handful of tighter, more controlled maps. I did have a bit of fun with the sPvP, it’s a lot tighter and you actually had to put thought into your build and tactics, however EVERY map has the same objective. 3 locations on the map, capture and hold them to generate points, reach 500 points to win the game. Not very original, but with only one game mode, I feel like I’m saying this a lot in this article, it gets old quickly. I found the 10v10 to be a bit too chaotic, the winning team being the one that can gank the best. I know I have complained about the game for close to 1000 words, but I did enjoy my time with GW2. I sunk over 50 hours into it within a week, but once that time had passed I found I was doing the same things over and over and over. Rinse, lather, repeat. It does bring a lot of new concepts to the genre and I think once these have been fully utilized they will be very effective, but at the the minute the game is overly shallow and surprisingly easy. There’s a lot of stuff I haven’t touched on such as the storyline, the crafting system etc. That’s generally because it’s meh, neither bad or good, somewhere in-between. It’s bad when you feel you’ve seen everything the game has to offer before you hit the level cap, but that’s exactly how I felt (and from talking to friends who have been playing for a while, I was right). At the same time, with no subscription fees, a £30 game that offers 50 hours worth of enjoyable play certainly isn’t a failure, but I couldn’t see myself spending much more time in the world of Tyria. Related to the above article although not a strong enough topic to warrant it’s own page, I did want to touch on the subject of dedicated healers in games. The MMORPG as a whole seems to be moving away from the idea of a party having a dedicated healer, think your Monk/Priest/Cleric. SW: The Old Republic tried to merge it’s healing classes into the other, more popular classes, creating hybrids, meaning that you can play as a heavy armour wearing Republic Trooper, standing in the back ranks, raining down a hell-fire of laser rain upon your enemies and at the same time providing healing support to your team. GW2 handles it by removing any kind of direct team heal and making every profession self-sufficient, with their own healing skill to look after themselves and no one else. While I understand why games are doing this (less waiting times in dungeons, raids, etc. ), sometimes I just want to fill the red bars. Bring back the Monk! This entry was posted in Features and tagged dungeons, gaming, gaming rig, guild, guild wars, guild wars 2, gw, gw2, MMORPG, monk, PC, quests, raids, ranger, skills, star wars, swtor, the old republic, videogames, wars, weapons. Bookmark the permalink. A 40k blog for the competitive gamer!